Russian-Japanese relations are not lacking for drama. The two countries gravitate to each other in the economic sphere, but are at odds over territorial issues. Neither country wants to take a back seat to the U.S. or China, yet neither wants to break off their alliance or partnership with them either. Both strive for independence in regional affairs, yet favor different approaches to security and other key issues – including the North Korean nuclear missile programme and the U.S. missile defense system. The leaders of both states have taken steps towards rapprochement, but the two societies generally distrust each other and neither side can accept the other’s position concerning the Kuril Islands. At the same time, their mutually complementary economic interests naturally draw them together and both countries consider it abnormal that they have yet to sign a formal peace treaty. The edifice of Russian-Japanese relations can only be erected through sustained and painstaking effort. Is there sufficient time for the two countries to accomplish it? Ideally, Moscow would like to see Russia’s position in East Asia and the Asia-Pacific region as the exact opposite of what it experiences in Europe, where conflicts, geopolitical frontiers, sanctions, and echoes of the Cold War create a weighty burden. Russia is striving to integrate into the dynamically developing region and to develop its Far Eastern territory in cooperation with its Asian neighbors. 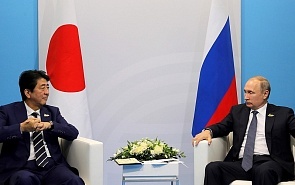 Moscow would like to establish a strong partnership with Tokyo aimed at developing the Russian Far East and at helping Japan become a more independent regional player with friendly relations towards Russia. The ideal arrangement for Tokyo would be for Russia to abandon its support for China and exhibit greater independence in regional issues, while Japan would get the disputed southern Kuril Islands and access to Russian resources. Japan’s long-term plan is to transform Russia into one of its closest friends, to the point of forming a U.S.-Japan-Russia triangle in which Japan would mediate disagreements between the other two. In all likelihood, neither of these desired futures is fully attainable, especially if a conflict arises that touches on the interests of both countries.